It was with great sadness on 18th July last year that we all learned of the untimely passing of Frank O’Halloran, a great friend and community activist. For those, like myself who knew little about his earlier life; he was born in 1939 and grew up on the family farm in Parishtown with his two brothers; Pat and Josie and five sisters; Mary, Chris, Ann, Geraldine and Maura. His schoolboy days were spent attending the Old Schoolhouse in Killola, Rosscahill where he received a basic national school education. Later he went on to find temporary work with the County Council and Forestry, before joining Monaghan’s as a construction labourer. In the mid 1960’s he worked for CIE as a bus conductor on the Carna run and sometime after that he joined Padraic Faherty, Rushveala where he learnt his trade as a painter/decorator. My early childhood memories of Frank are bumping into him in Pascal McDonagh’s or Tommy Geoghegan’s shop as we both gathered the messages for our families. It was the early 1970’s and like myself, Frank’s mode of transport at that time was the bike. I remember on one or two occasions seeing him cycle his High Nelly out the Cloosh Road with a timber ladder over one shoulder and the jute shopping bag latched over the handlebars. During the week he always had a sign of work about him, kitted out in his painter’s overalls, but Sunday mornings were reserved for dressing up in a shirt and tie and attending Mass with his family. I became more acquainted with him around 1980, when I began my underage football career for the GAA Club alongside Tony at U16 level (there were no U12 or U14 Club competitions back then). Frank was one of a few fathers who took time to attend games. Over the subsequent years as we made our way up through the ranks from underage to senior, I was fortunate enough to play alongside his other sons; Finbar, Bosco, Frankie and Kieran. As we entered the 1990’s the club struck upon one of its more successful decades with at least one of its adult teams (U21, Junior and Intermediate) winning a county final practically every second year (1990/1992/1994 and 1996), each of those teams was bolstered by the presence of the O’Hallorans. 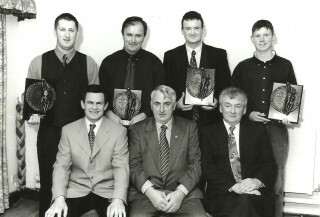 It was probably 1996 that would rate as one of Frank’s proudest years as he had taken on the Chairmanship of the club; the four lads had played a major part in winning the Intermediate League and Championship, three of the girls: Joan, Maria and Hilda were playing their part in the good fortunes of the club’s first ever ladies football team, while he himself was back to full health after a heart bypass operation a year or so earlier. Also around that time Mary found herself drawn into the club’s activities. There was many a day she was on hand to help make the obligatory post match sandwiches; as they say, behind every great man is a great woman. The visit of the long awaited return of Sam Maguire in the weeks following the 1998 All Ireland Football Final was undoubtedly another highlight for Frank in his role as Chairman. By then he was well used to drafting speeches congratulating successful teams! 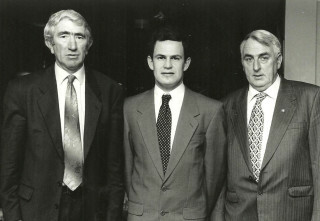 He was proud of the fact that the club was represented by his neighbour Padraic Boyce, and as he himself had worn the Killannin colours in his earlier football career, he had a unique connection with Kevin Walsh and Gary & Richie Fahy. Indeed he felt vindicated for holding the view that once the boys in the West Board got fair consideration for the county team, Galway Football could only improve. The 1990’s also rang in an era of major development of club facilities such as the Stand and new dressing rooms, training pitch, floodlighting and barrier nets. From the outset Frank, along with his brother-in-law and then club President P. Joe O’Malley, were to the forefront in progressing these developments. 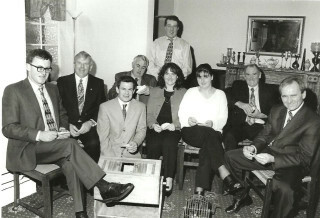 In August 1993 the club embarked upon its weekly fundraising lotto, a move which proved a lucrative one and ultimately financed the development projects, while greatly enhancing the prospects of approval for sports capital grants. However, the operation of the lotto placed an added responsibility on the committee, but who better than the two elder statesmen to put their shoulders to the wheel. 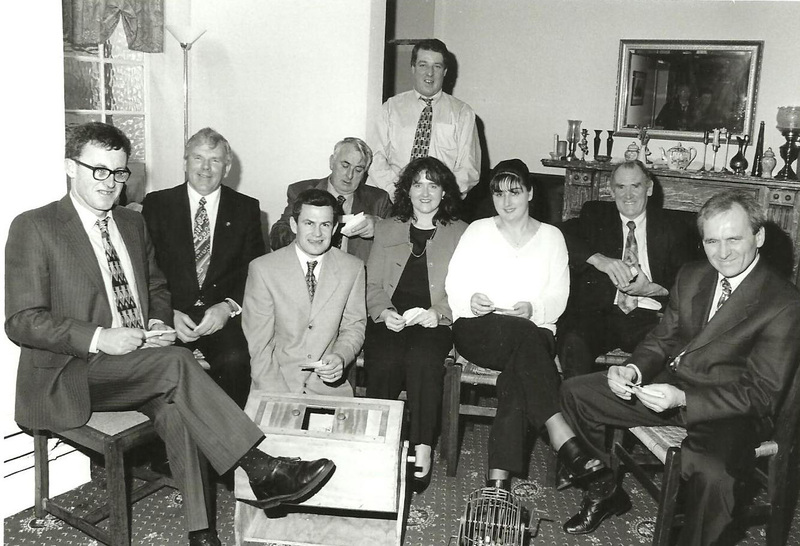 Over the following seven to eight years they headed up a sub-committee which turned out consistently each Saturday night to run the lotto draw and it wasn’t until the turn of the century that the current sub division of the lotto and rota system was introduced. During the first two to three years of the lotto I used to meet up with Frank again on Sunday mornings in Faherty’s Bar to handwrite and distribute the results sheets and his girls would often come along to help us out. Computerisation meant we could dispense with the handwriting, but there was still the duty of distributing results and tickets, which Frank continued doing right up until he became ill.
During Frank’s tenure as Chairman I recall that there were a number of requests from local organisations, who were looking for a home, to become incorporated in the development of facilities in Corribdale; the Boxing Club, the Red Cross, the Youth Café and the Naíonra. Each got a warm reception and fair consideration from Frank and when he put it before a club meeting, the plans always seemed to have his approval. Indeed Frank generally was the first person to put his name forward to become involved in the consultation process and meet with engineers. He was always conscious of the fact that the club was dependent upon community support and if we were in a position to assist someone, then there was an onus on us to do so. Unfortunately, having progressed each of the plans, they ultimately failed because of lack of funding. Indeed the last set of drawings which Frank commissioned, consisted of a two storey sports hall to replace the old dressing rooms, cater for indoor training and to house the Boxing Club. The fact that the current Boxing Club plans are somewhat inline with this, albeit on a reduced scale, is firm evidence of his foresight. The loss of P. Joe in 2002 took some wind out of his sails and as he handed the Chairman’s job over to David Healy, he became the automatic choice to fill the shoes of the club’s fallen president. This was another role he carried out with distinction, initially serving alongside Jim Joe Clancy and in recent years alongside Paddy Geoghegan. In 2004 when I was preparing to move back into our new house at Ardvarna, Frank and Frankie appeared onsite one day to lend a hand. They gave up two to three days of their busy schedule to help me with the internal painting. I’m sure there is many a house in the parish which experienced a similar kind gesture during the course of Frank’s life. Also, if I remember correctly, the first coat of external paint applied to the GAA stand was done voluntarily by the two lads. These memories serve only as a snapshot of Frank’s dedicated work throughout the community. I know that as I put pen to paper I am overlooking some of the other committees which were fortunate enough to have him on board at one time or another. I am sure that many a chapter could be written about his involvement in organisations such as The Pioneer Association, The Show Society, Oughterard Credit Union and CROÍ. Now I possess a box of treasured GAA photos illustrating his life and times on the various GAA committees. Many fond memories come flooding back as I browse through them from time to time. It was heart-warming and fitting to see the large congregation of members from the GAA, Show Society and Pioneer Association who turned up on the morning of his removal to express their gratitude to him and show solidarity with the family by organising a guard of honour from Cloosh to the church and then on to the cemetery. It was testimony to the high esteem in which he was held within the community and an appreciation of his honest endeavour, his kind nature and his personal integrity. Our lives and our community have been enriched through his hand of friendship. Go ndéanta Dia trócaire ar a anam.